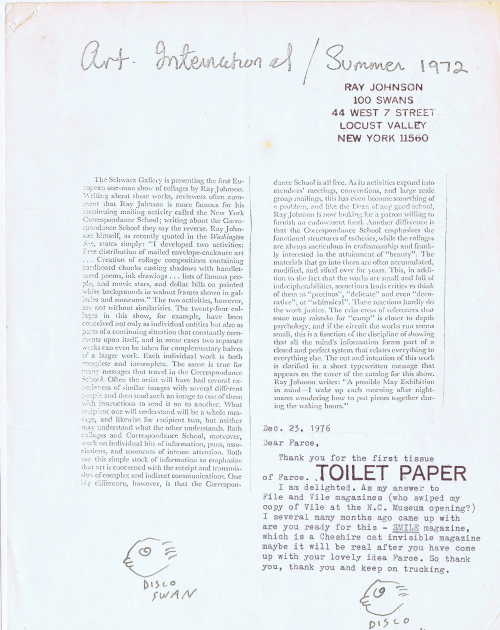 This page is to document and promote the work of Ray Johnson, the father of mail art and and extraordinary 20th century artist period. Ray was born in Detroit, attended Black Mountain College, and lived in New York City. 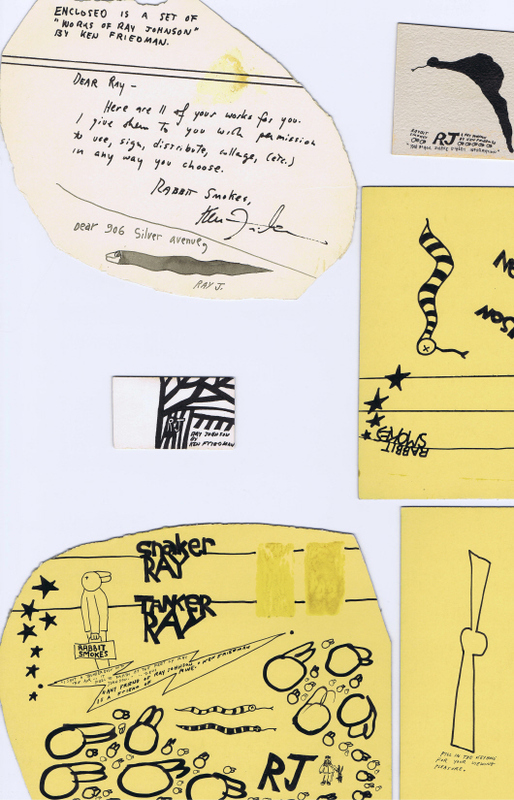 He created collages, helped found performance art, and touched thousands with his mail art. Below the links are images of my correspondence with him in 1976-77. Something Else Entirely: The making of The Paper Snake. exhibit review. 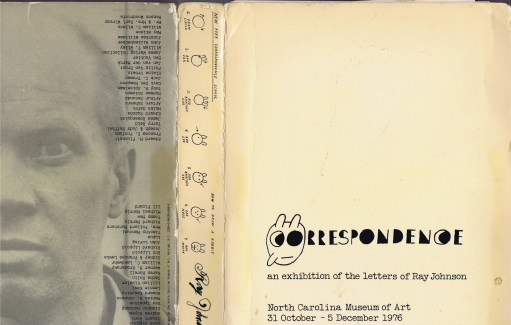 As I relate on my Black Mountain page, I attended a large exhibition of Ray’s mail art at the NC Museum of Art in downtown Raleigh in 1976. I bought the catalogue and wrote to Ray, who responded and continued to exchange with me over the next year. Below are Ray’s sendings. 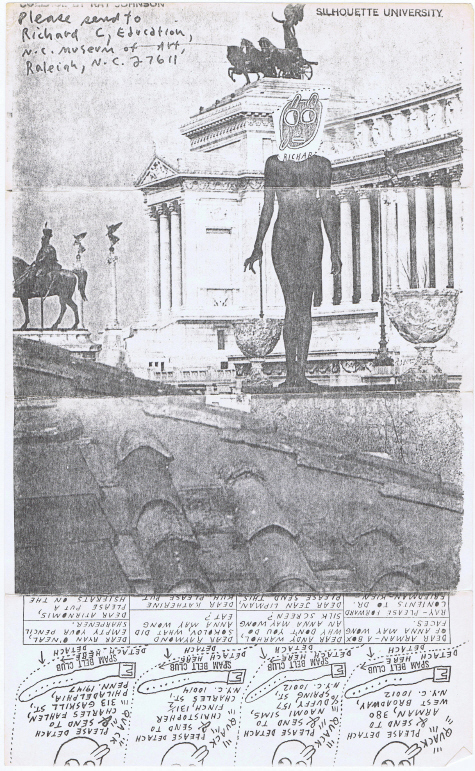 Below is a photocopy of a piece Ray sent me with a request to send it on to Richard C, a Raleigh friend of his who had set up the museum show. 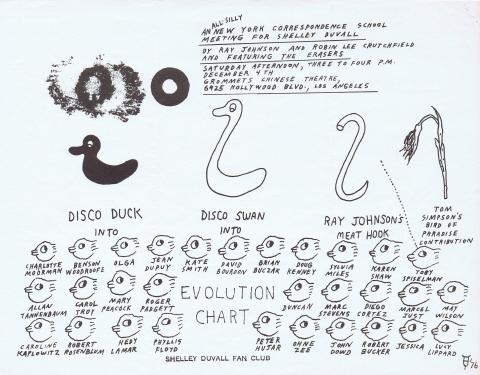 Richard and I became friends, and in the 80’s I had a show of his mail art at The Paper Plant. 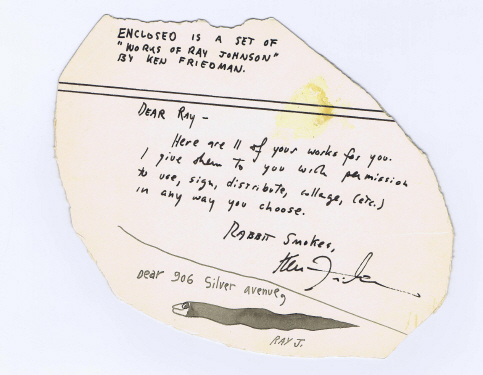 The last time Ray mailed to me, he re-conveyed to me some artwork mailed to him by Ken Friedman. he folded Ken’s work in a large R.L. 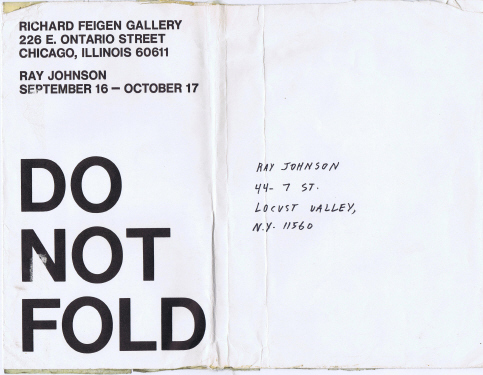 Fiegen envelope that said DO NOT FOLD and sent it my way. 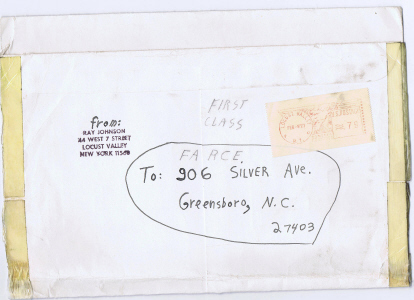 Ray’s correspondence was very stimulating to me and I have pursued mail art ever since. Below is the catalogue I bought in 1976. I keep Ray’s personal correspondence in it and I understand it is a prized item on many levels. I have so appreciated the stimulation and opportunities for renewing my thoughts and work about Ray provided by the Black Mountain College Museum and Art Center. I also look forward to learning more from the work of Sebastian Matthews, curator of the Ray show, and Kate Dempsey, whose passion and ideas about Ray’s work are so exciting. 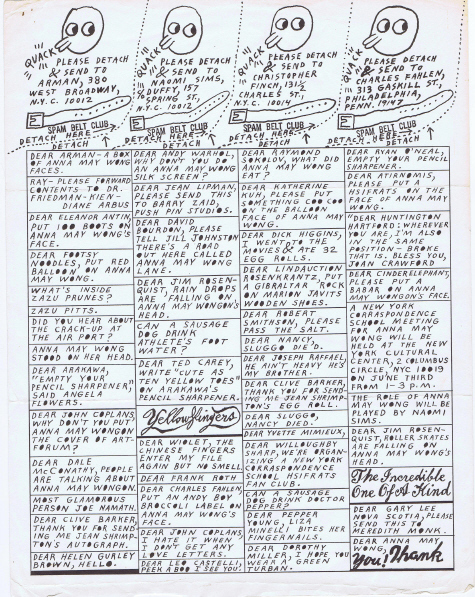 Subsequent additions to this page will explore more of Richard C’s work and other mail art associated with Ray Johnson. 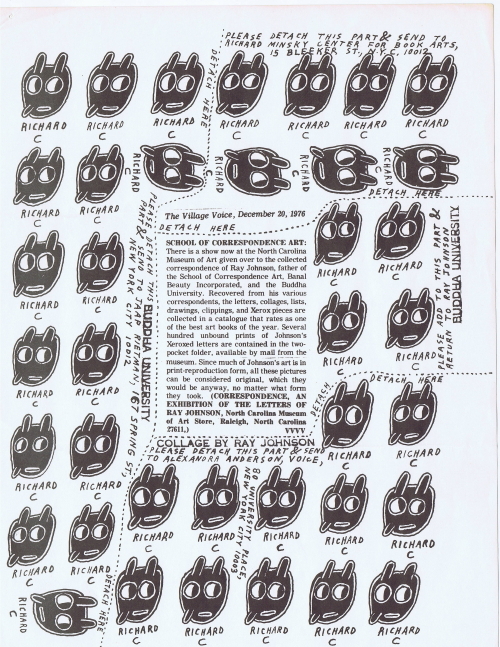 My friend, Richard Craven was/is an artist who used to correspond with Ray Johnson and has hundreds of postcards from the Correspondence School. Yes, Gary, Richard C is who helped get Ray his show at the old Museum of Art downtown, where I encountered Ray’s work, and subsequently corresponded with him and with Richard, who later had a show of mail art at The Paper Plant. (He mailed the entire show, of course). Well, marvelous. I would like to suggest that you contact a young artist in Franklin named Justine Moe. He is on Facebook. I think you would like his art.